It's a southeastern freeway, which be default usually means it's tree lined and boring. 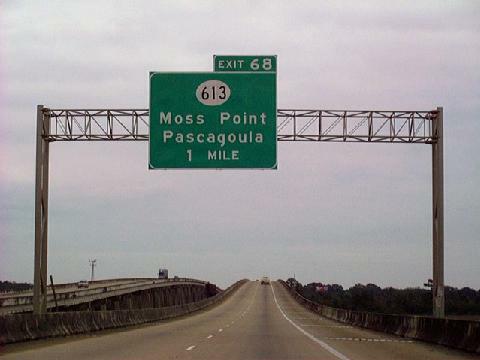 However, I-10 sees a seven mile crossing over the Pascagoula River near Moss Point that gives a nice reprieve from the humdrum pine forest. Construction still is ongoing to complete a six-laning from EXIT 28 to Interstate 110. Widening will continue eastward to EXIT 57 in the near future. The widening is addressing some of the issues, but the freeway sees a good amount of traffic for its remaining four-lane segments. The sign panels don't reflect well during the humid nights of the Gulf Coast. Condensation often obscures the signs on those moist nights. I-10 shield by Alex Nitzman.